The L-Series rocker switch is an innovative product offering total design flexibility, while at the same time setting new standards for performance and reliability. Its versatile design features include a neatly proportioned size that fits into an industry standard mounting hole of 44.0mm x 22.0mm, countless unique choices for ratings, circuits, colours, illuminations and laser etched legends. Share the post "L-Series Switch 1-Pole 24VDC On/Off/On Indicator"
1250 Volts RMS between pole to pole; 3750 Volts RMS between live parts and accessible surfaces. 90/10 Silver-Nickel, Silver Tin-oxide, Gold. Brass or copper/silver plate 3/16” (4.76mm) & 1/4” (6.3mm) Quick Connect terminations standard. Incandescent – rated 10,000 hours (standard); LED – rated 100,000 hours 1/2 life (optional) (LED is internally ballasted for voltages to 24 VDC). Rocker, base & bracket are sealed. Nylon 66 GF rated to 85°C with a flammability rating of 94V0. Basic actuator structure molded of thermoplastic polycarbonate with a hard Nylon 66 thermoplastic surface overlay. Nylon 66 rated at 85°C. Polarized. IP67 for above panel components of the actual switch, representing an index of protection as applied to electrical equipment in accordance with IEC 529, BS 5490, DIN 400 50 & NFC 20 010. Per Mil-Std 202F, Method 101D, Test Condition A, 48 Hrs. 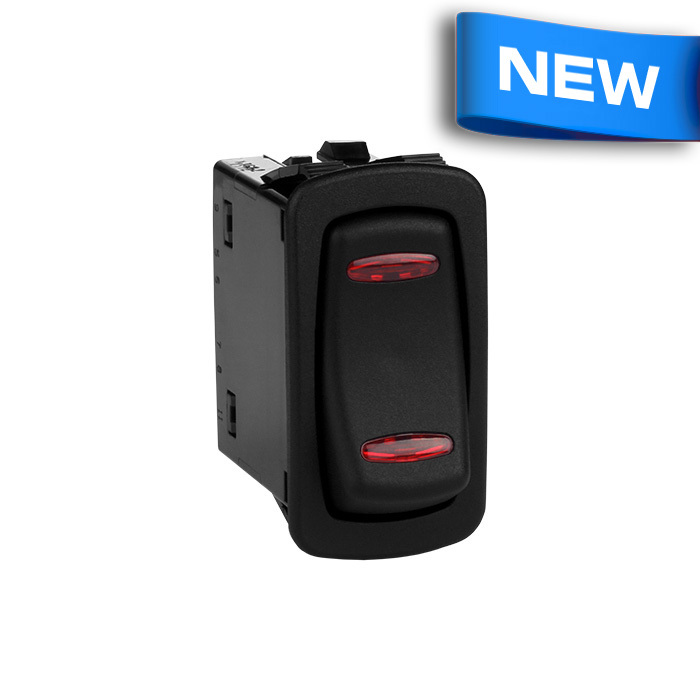 The L-Series rocker switch is an innovative product offering total design flexibility, while at the same time setting new standards for performance and reliability. Its versatile design features include a neatly proportioned size that fits into an industry standard mounting hole of 44.0mm x 22.0mm, countless unique choices for ratings, circuits, colours, illuminations and laser etched legends. 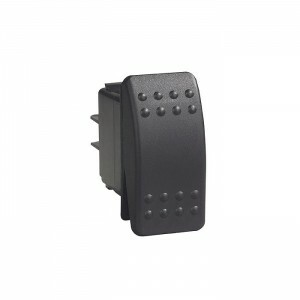 These single or double pole switches also feature a broad choice of actuator styles, colours, and lenses with up to twelve terminals offering an extensive range of switch and lamp circuit options, including LED or incandescent illumination. Additionally, an optional plug-in terminal connector enables pre-wiring of wire your harness.